5 reasons why we’ll be at UrbanLabs! let's invent our collective future! … to provide an early opportunity for policy makers and stakeholders from Birmingham and the West Midlands to quiz other major European cities that are further along the journey in developing their own digital district. This dialogue will inform Birmingham’s policy thinking and ideas as the city embarks upon developing its own digital district. View more documents from Chris Pinchen. Birmingham’s Digital District Part 2- the Panel Session from Paul Hadley on Vimeo. Jon Hickman: MA in Social Media from Kasper Sorensen on Vimeo. When it was announced that Birmingham City University was going to be offering the first MA in Social Media anywhere, the blog & twittersphere went crazy here in Spain. One of the many reasons for this is the power of validation that events from elsewhere have here, something I will explore later in another post as part of a wider analysis of cultural differences & social media. I like this video of course leader Jon Hickman presenting the MA because it’s the antithesis of academic presentation in Spain. It’s in what I’m becoming to think of as “the Birmingham School” – in a pub and with an appearance by Andy Mabbett! What the hell is Citilab? Chris Pinchen from Citilab in Barcelona from Podnosh on Vimeo. 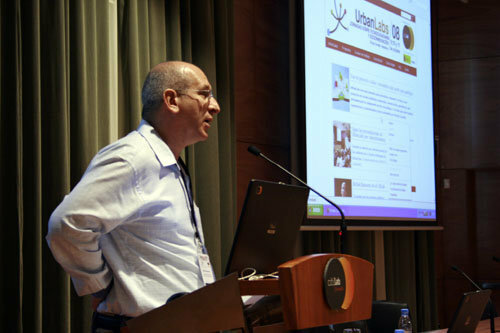 I met Michel Bauwens, the founder of the P2P Foundation, at UrbanLabs which took place at Citilab in Cornellà, Barcelona. He kindly agreed to record an interview for the PodCamp Barcelona Podcast, but due to his hectic schedule it was impossible to do until recently. I finally caught up with Michel when he was in Amsterdam and we recorded this conversation over Skype from his hotel room. I think the recording provides a very good introduction to the work of the P2P Foundation and Michel’s vision. We function as a clearinghouse for open/free, participatory/p2p and commons-oriented initiatives. promoting free cultural exchange by abandoning the innovation-inhibiting conceptions of pseudo-scarcity in the cultural world (i.e. based on the assumption that the free flow of culture needs to be restricted through excessive copyrights etc…). Copyright © 2019 Cataspanglish. All Rights Reserved. The Gridiculous Theme by bavotasan.com.